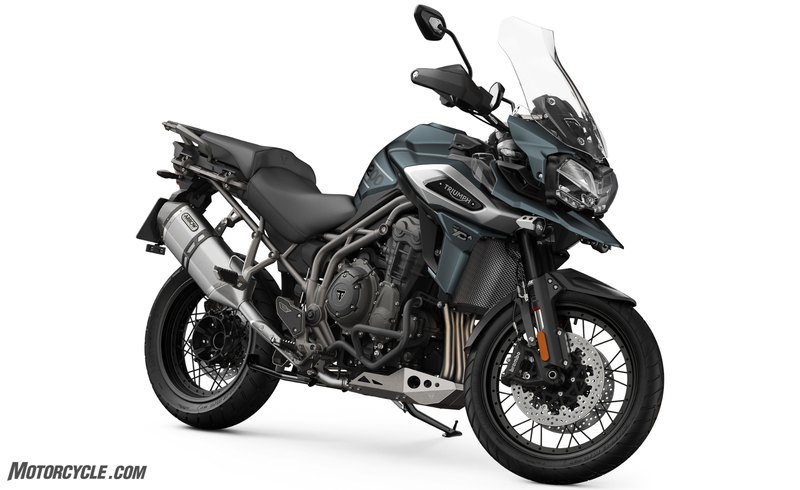 Triumph Motorcycles played its hand in the big Adventure-tourer market at Milan’s EICMA show, unveiling its heavily updated 2018 Triumph Tiger 1200. With over 100 updates each, both the XR and XC models have lost weight and received upgrades to help them keep up with their competitors. 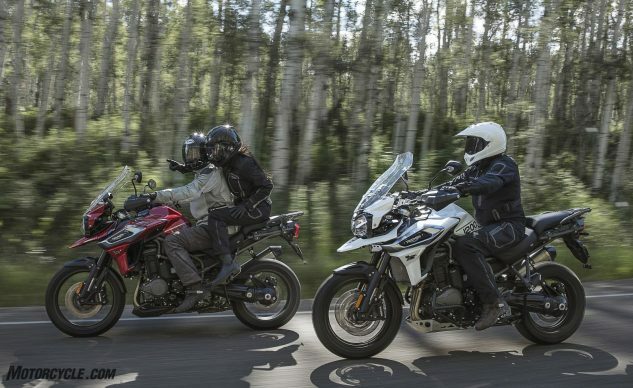 Triumph claims the 1215cc Triple has a “significant new engine update” for better low-rpm power delivery, although there aren’t many clues about what that means. The engine is the same size and power output (139 horsepower and 90 ft.-lbs. of torque) as before, but Triumph does claim that 10 kilos – 22 pounds – has been saved by refining engine, chassis and exhaust components, including the silencer (it’s now titanium and carbon fiber, thanks to Arrow exhaust) and engine internals. Off-road-able Tiger 1200 XC comes in two trim levels, both with 19-inch spoked wheels. 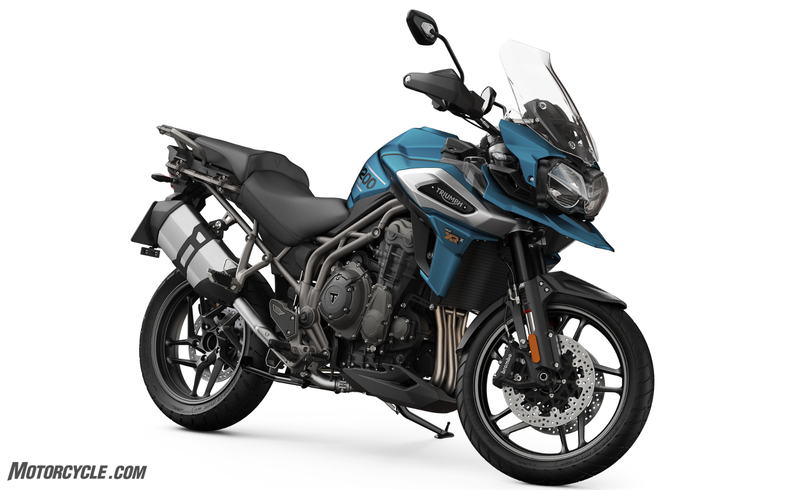 The Tiger 1200 (don’t call it Explorer no mo’) also gets a raft of comfort, convenience and styling changes. As Dennis Chung surmised last week, Triumph now offers adaptive cornering lighting that increases lighting intensity based on lean angle. There’s also a new five-inch full-color TFT display, backlit handlebar switches and joystick-like “switch cubes,” plus an optional “Off-Road Pro” riding mode that lets you disable the traction control and ABS, just in case you haven’t yet broken a collarbone. But wait, there’s more! ADV riders love their farkles, and Triumph wants to please. Also new for 2018 is Triumph Shift Assist for smooth, easy gearchanges, a keyless ignition, updated cruise control and all LED lighting. It’s all wrapped up in new bodywork and rolls on new cast and spoked wheels. We’re looking forward to riding what promises to be an even smoother, more comfy and better-handling go-anywhere adventure bike. Triumph USA has not yet released delivery dates or prices. Pavement-pounding XR comes in four trim levels. The top three use WP semi-active suspension damping.